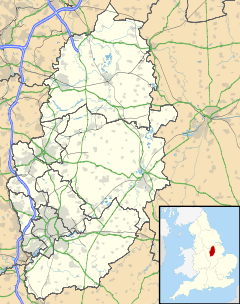 St Ann's is a large district of the city of Nottingham, in the English ceremonial county of Nottinghamshire. The population of the district at the time of the United Kingdom census, 2011 was 19,316. The Oswell was a cold water well with alleged magical powers that could cure sore eyes. In 1500, the name changed to honour St Ann, whose cult was ascendant at the time. St Ann was the patron saint of lacemakers, pregnancy and women who had difficulty in conceiving. Water from the well fed a beck (stream) that ran through "The Spring" to the river. There are several ancient names attached to area Peas Hill (1230), Hunger Hills (1304) and Clay Fields. In the 1750s Charles Morley started manufacturing brown earthenware, specialising in beer mugs. In the 1830s Clay fields was divided into plots. With The Enclosure Act of 1845 allowed the city to take 1,068 acres (432 ha) of the Clay fields. It was used for housing, and by 1880 the build of 'New Town' was complete. It was specifically built for the working poor. They were very basic cottages, with a butcher, a baker, a large number of public houses, a market place and, for the first time in Britain, allotments where the poor could grow their vegetables. The Public Health Act 1875 enabled local authorities to make byelaws to regulate such building. Here all the houses were pre-Public Health Act terraced houses, on a gridiron plan arranged around courts of ten houses. These were later demolished under slum-clearance legislation of the 1960s. The estate was a town within a town, the local constabulary refused to enter St Ann's estate, so policing was managed by the residents relying on 'family affiliation'. It was an area of hard work and low pay that culturally was separate from Nottingham. But it was an area of 10,000 houses where only 9% had an inside toilet, and 50% had no hot water system- many of the yards had shared toilets and open sewers leading to dysentry and cholera. Infant mortality was three times the national average. The latest immigrants, and in 1968 that meant West Indians and Jamaican in particular, had been allocated the worst housing. Clearances of houses such as these started in 1930, but because of the war 'New Town' continued until 1970. The houses were flattened and the residents dispersed. In 1970, the Victorian streets were replaced with a Radburn style estate. While this introduced a more modern housing stock, the confusing pattern of facing houses with differing street names and the maze of undistinguishable walk-ways made the new estate impenetrable to outsiders. The houses were built by Wimpey, using prefabricated techniques. The first residents were proud of the houses, but critical of the design of the estate. St Ann's lies within the unitary authority of Nottingham, and so is governed by Nottingham City Council. St Ann's lies east of Nottingham city centre, with Thorneywood to the north east and Carlton Road forming the unofficial boundary with Sneinton to the south. In common with other parts of the city, the largely working-class population is still affected by the collapse of manufacturing industry and much of the area scores badly on government measures of deprivation. It is ethnically mixed with a strong sense of community. The population in 2005 was around 15,000. St Ann's is home to people from all over the world, such as: Pakistan, the West Indies, Iran, Romania, Greece, Portugal, Somalia, Sudan, Guinea and Thailand. The area has a Pakistani Community Centre and the African Caribbean National Artistic Center (ACNA). In the nineteenth century, the local industries were lace and textile manufacturing, like most of Nottingham. There is the St Ann's market, which has won EU backing of £200,000,000 to regenerate the market back into its former heyday. There are several ethnic run supermarkets from Jamaican to Pakistani and from Somali to Portuguese. The two main ethnic supermarkets are Murat (which is Iranian) and Asiana, which is the largest oriental retail outlet in the East Midlands. The area takes its name from St Ann's Well, a spring once thought to have magical healing powers, at the junction of The Wells Road and Kildare Road. It was also known as The Brodewell, the Owswell, Robin Hood's Well, in records dating back to 1301. The people of Nottingham used to walk to St Ann's Well on Easter ('Black') Monday and celebrate with a party. It was covered by a spired structure from 1856 to 1887, which was demolished to make way for the railway and later built over by what became The Gardeners pub. Stonebridge City Farm, which charges no admission fee, is an urban farm that is active in the community. The last pub in the area was the Sycamore Inn, which closed in April 2014. The terraces north of Victoria Park have been listed as representing a style of domestic architecture that was once widespread but has been largely lost to bomb damage and slum clearance. The St Ann's Allotments is the oldest and largest allotment site in England, created in the 1830s and now Grade 2* listed as being of "Special Historic Interest". The allotments have received National Lottery funding for restoration, and were featured on the BBC's The One Show and Radio 4. The Nottingham Suburban Railway ran through the area, connecting Trent Lane junction in Sneinton with Daybrook, but bomb damage closed the Sneinton end in 1941 and the line ceased operations completely in 1951. Blue Bell Hill Primary School is on Gordon Road. The Ransom Road site of Nottingham Academy provides secondary education, along with the new St Ann's Well Academy on Hungerhill Rd. There is also Sycamore Academy and Huntingdon Academy. The parish church is St. Ann with Emmanuel; the RCCG Covenant Restoration Assembly St Anns meet in Blue Bell Hill Community Centre. There are few sports facilities actually in St Ann's, but across the ring road is the National Ice Centre, an Olympic-sized ice rink that is both home to the Nottingham Panthers, and also acts a major music venue of Nottingham. Nottingham Racecourse, the local horse racing track, and the Nottingham Greyhound Stadium are also nearby. Nottingham film-maker Shane Meadows used St Ann's for some scenes in the 2006 drama This Is England filmed in St Ann's. Ray Gosling, broadcaster and writer, lived in St Ann's and wrote about it. He also introduced a film about poverty in the area by Thames Television. ^ "City of Nottingham Council ward population 2011". Neighbourhood Statistics. Office for National Statistics. Archived from the original on 27 September 2016. Retrieved 18 April 2016. ^ a b c Baker, Mavis (12 July 2012). "St Ann's: a brief history". St Ann's Well Road Pre Demolition (1970). stannswellroad.weebly.com. Retrieved 18 January 2016. ^ McKenzie 2015, p. 23. ^ McKenzie 2015, pp. 23,24. ^ McKenzie 2015, pp. 28,29,30. ^ McKenzie 2015, pp. 38-39. ^ McKenzie 2015, p. 103. ^ Council, Nottingham City. "Centres for Non-geographically based Communities". Nottingham City Council. ^ "'Magical' St Ann's Well in Nottingham to be excavated". BBC News. 21 January 2012. ^ Boocock, Marcus (15 January 2014). "Landlord's shock as the 'last pub' in St Ann's faces closure". Nottingham Post. Archived from the original on 18 February 2014. Retrieved 20 March 2014. ^ "Oldest allotments in Britain". BBC. 14 September 2009. Retrieved 19 June 2012. ^ Clover, Charles (4 March 2008). "Britain's oldest allotments to get Lottery grant". The Telegraph. Retrieved 19 June 2012. ^ "£330,000 lotto boost for historic St Ann's allotments". Nottingham Post. 11 February 2012. Archived from the original on 5 May 2013. Retrieved 19 June 2012. ^ "Gardeners' Question Time". BBC Radio 4. 14 August 2009. Retrieved 19 June 2012. ^ wearebase.com, Base,. "Service 39 on Blue Line". www.nctx.co.uk. ^ wearebase.com, Base,. "Service 40 on Blue Line". www.nctx.co.uk. ^ wearebase.com, Base,. "Service 40B on Blue Line". www.nctx.co.uk. ^ wearebase.com, Base,. "Service 41 on Blue Line". www.nctx.co.uk. ^ wearebase.com, Base,. "Service 42 on Blue Line". www.nctx.co.uk. ^ wearebase.com, Base,. "Shoplink service S11 ran by Silverdale Tours" (PDF). www.silverdaletours.co.uk. ^ "St Ann's Nottingham 2011 Census Data". Nottingham City Council. Retrieved 9 April 2018. ^ Faruq, Tahire Mehmood. "UK Mosque Masjid Directory - Complete Listings". www.mosquedirectory.co.uk. Archived from the original on 13 January 2015. Retrieved 13 January 2015. ^ Meadows, S,(20 March 2007) This is England in Nottingham, BBC Nottingham website. ^ Gosling, Ray (1969). "Report, St Annes, Nottingham Slums". YouTube. Thames TV. Retrieved 18 December 2015. Gosling, Ray (1967), Saint Ann's. Nottingham Civic Society. Gosling, Ray (1980), Personal Copy: a memoir of the sixties. London: Faber. ISBN 0-571-11574-8. Coates, Ken; Silburn, Richard (2007). St. Ann's : poverty, deprivation and morale in a Nottingham community. Nottingham: Spokesman. ISBN 9780851247328. Coates, Ken; Silburn, Richard (1983). Poverty : the forgotten Englishmen (4. ed.). Nottingham: Spokesman. ISBN 0851243754. McKenzie, Lisa (14 January 2015). Getting By: Estates, Class and Culture in Austerity Britain. Policy Press. ISBN 9781447309956. Wikimedia Commons has media related to St Ann's, Nottingham. "BBC Inside Out — Gun Crime". The BBC's "Inside Out" investigates how one group in the St Ann's neighbourhood are doing their bit to fight in the battle against crime. Retrieved 7 October 2005. "St Ann's Under Construction". Local history page charting the creation of the St. Ann's area. Retrieved 7 October 2005. "Oldest allotments in Britain". BBC Nottingham website. BBC Nottingham, London Road, Nottingham, NG2 4UU. 13 November 2014. Retrieved 21 July 2016.